Fibromyalgia is one of those illnesses that many people throughout the United States suffers with. It is estimated that in the United States there are around 5 million people who are 18 years of age and older that suffer with this illness. What comes as a surprise to most people is that we are still learning things about this illness. Despite so many people suffering with this, there is still tons of information that we do not know about this illness and how it affects the body. We do know that it causes people to become extremely tired, and they may be in a lot of pain. However, as we study this illness more and more, it is becoming clear that those small issues that people have may be due to having fibromyalgia! Brittle Nails: What are These? One of the issues that we see in some fibromyalgia patients are brittle nails. What are brittle nails? Brittle nails are categorized by nails that are cracked, chipped, split or peeling. This is often a sign of aging or using nail polish for years, or even be a result of having your nails exposed to moist conditions such as swimming a lot or even washing dishes. While these brittle nails are not going to directly affect your health, they can cause some discomfort for people. Especially women! Many women hate that their nails are brittle and look weak as this can affect the overall type of appearance that they want to portray. For those who suffer with fibromyalgia, there are many people who feel as though this issue is just another one that makes them tired of dealing with this illness. So, what can you do with brittle nails? There are several different treatments for brittle nails. 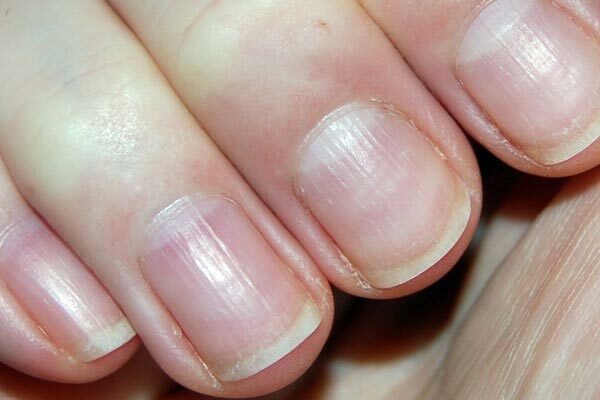 Many people find success with home remedies for their brittle nails, so this is worth a try! Warm some coconut oil and then rub this onto each nail. Massage this for around five minutes into the cuticles on the nail. This is meant to improve blood circulation and keep the nails moisturized. This can be done two to three times per day. Mix water and equal amounts of apple cider vinegar. Soak your nails in this solution for a few minutes. Afterwards, dry these off and push back the cuticles. You can do this for a few days, daily and the nails will become stronger. Vitamin E oil is meant to moisturize the nails. To use this, take a Vitamin E capsule and extract the oil from this. Apply this to the nails before ebbed, and massage this into the nail bed. You will want to do this daily for a couple of weeks and you will notice the change! This is an herb that is known for containing high amounts of silica which is needed for health and strong nails. You can add two teaspoons of this into a cup of hot water and seep this for 10 minutes. Once this is cool, soak your nails in this solution for around twenty minutes. This can be repeated three to four times per week. Utilize tea tree oil with Vitamin E oil to help the overall effects. Massage this into the nailbed and leave this on the nail for at least 30 minutes. You can do this twice a month. Take two tablespoon of fine grain sea salt and put this in a bowl of warm water. Add some essential oils like lemon and then soak your nails for around ten to fifteen minutes. You can do this two to three times per week if needed. Lemon juice can make your brittle nails more healthier and make these appear better. You will want to miss one tablespoon of lemon juice to three tablespoons of olive oil. Put this onto the nails before bed, cover your hands with gloves, and then leave this overnight. This is great for nail and hair growth. For those who are deficient in this, they are going to notice that their nails are brittle, along with having brittle hair. You can take this as a supplement or increase eating lean meats, seafoods and breakfast cereals that are fortified with zinc. Iron can cause brittle nails. If you are afraid that you are iron deficient, eating more red meats, turkey and eggs can help with increasing these levels in your body. Brittle nails may be due to the nails not growing as they should, and Vitamin C can help with this. You are going to find that eating Vitamin C in fruits is a great option, but many people decide to take this as a supplement. This is a B-vitamin so a person could take a B-vitamin complex in order to get this supplement into their diet. Biotin can also be taken by itself. Biotin has often been called the hair and nail supplement that everyone needs to be taking! Remember, a good multi-vitamin is something that all fibromyalgia sufferers need to take in order to keep their body in order. Why Fibromyalgia Sufferers Deal with Brittle Nails? Fibromyalgia sufferers find that their symptoms can register in different ways. There are several patients who find that brittle nails are one of the small issues that they deal with. While, other patients may find that they never have to deal with brittle nails. This is why this illness is so strange. Many people all have similar symptoms, while others may show symptoms that are rare and only happen every now and then. This is what makes this illness so hard for diagnosis, as many people take months to be diagnosed with fibromyalgia. Other illnesses have to be ruled out before handing down this diagnosis. While brittle nails may not be something that most people worry about. For many, this appearance is something that makes the person feel uncomfortable. Due to the other fibromyalgia issues that a person may have, people find that this is just another issue that they cannot control. Having some control over these issues is what gives most people peace of mind. The good news is that you can talk with your doctor and discover what could be the issue for the brittle nails. For many people, a blood test can tell if you are low on something that could be causing brittle nails, and this can be corrected with ease.